Withered from flea beetle damage and dry conditions, these plants are not healthy. Flea beetle stem feeding has killed these seedlings. An on-farm scenario. 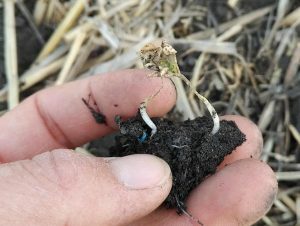 One grower described a situation were only a small percentage of seeds germinated in an early-seeded canola crop and these were under heavy pressure from flea beetles. Then it rained and the rest of the seeds started to emerge. 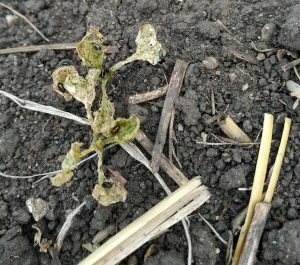 Because these later-emerging plants will grow faster due to the moisture and warm soils, because they are no longer the earliest plants in the area, and because seed treatment on newly-emerging seedlings will still be effective, the flea beetle threat per plant should be lower for this second stage. In this situation, the grower may be better off not spraying for flea beetles immediately, letting them feed on the first-stage plants with the idea that the second-stage plants, if enough of them, could produce a decent crop on their own. With good growing conditions, emergence and survival of the second stage could be very good, becoming, in a way, like a “reseeded” crop. But make sure enough plants emerge and that the stand is uniform across the field. It may seem like only 30% of the seeds emerged the first time around, but flea beetle feeding may have wiped out a large number of emerged seedlings before the grower even noticed they were gone. If the field is likely to have a lot of areas without any plants, reseeding may be the best scenario — especially if seed company programs and/or crop insurance make it more economical. Help for the reseeding decision. Even if a lot of the first-stage plants survive, creating a multi-stage crop, leaving this crop for straight combining (it was a shatter-tolerant variety) may solve this issue. Late plants can catch up through the summer and close the maturity gap, and with a shatter-tolerant variety, first-maturing plants can stand and wait for late plants to catch up with minimal losses.